Posted on Fri, Jan 13, 2012 : 5:44 a.m.
Is it an out-moded institution? 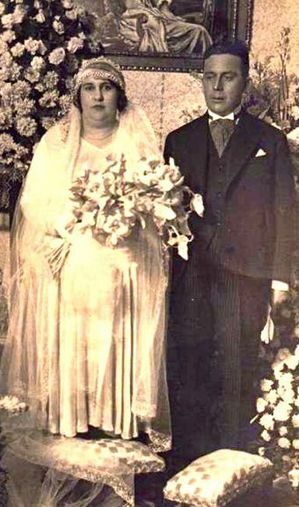 A typical wedding couple 100 years ago. Editor's note: This post is part of a series by Dr. Baker on Our Values about core American values. This week, Dr. Baker is discussing marriage; do you think it's becoming obsolete? Are you married? If so, you and your spouse are members of what may soon be the newest minority: married Americans. Only 51 percent of American adults are married, according to U.S. Census data analyzed by the Pew Research Center. Almost three in ten (28 percent) have never married. In just a few years, the percentage of married American adults may be less than 50 percent. The percentage of married Americans has been declining for decades. In 1960, for example, 72 percent of American adults were married. Only 15 percent had never married. Americans of all ages are less likely to marry now than before, but the downward trend is steep among young Americans — 18 to 29 years of age. In 1960, 59 percent were married. Now, it's only 20 percent. There’s been an especially sharp drop in the number of married Americans in the last few years. From 2009 to 2010 alone, there was a 5 percent decline in new marriages. The poor economy could explain recent declines, but the long downward trend has taken place in good economic times and bad. Economics may exert influence, but it isn’t the whole story. The marriage decline isn't an "American problem." That is, there isn’t something peculiar about American culture or values that turns Americans away from marriage. Rather, marriage is becoming less and less prevalent in just about all economically advanced societies. Marriage is one of the world’s oldest institutions. But it may be on the way to becoming an outdated and anachronistic institution. Are you alarmed by the increasing unpopularity of marriage? Have you delayed or avoided marriage? Do we really need marriage anymore? Please, add a comment below. Originally published at www.OurValues.org, an online experiment in civil dialogue on American values. Fri, Jan 13, 2012 : 6:28 p.m.
What is Marriage? : If marriage is viewed as a relationship between two persons, we may have to identify the beneficiary of this relationship. We have to know if the relationship exists to provide a benefit. It is my impression that the marriage relationship exists to provide a benefit to the product of that relationship; the child has a natural right to obtain parental care and attention from both of its biological parents. When I speak about commitment in marriage relationship, the commitment refers to defend the rights of the child who came into existence because of the married relationship. When I speak about trust and confidence in the context of married relationship, it refers to the trust and confidence in the partner of the relationship to uphold the natural rights of the child who begins his/her existence because of the relationship. In relationships where there are no new products from that relationship, the relationship tends to exist as a matter of convenience and there is no obligation to sustain the relationship. If marriage is relevant, it is not on account of direct benefits it may bring to the partners; it is an obligation to accept the fruits of own actions in a responsible, moral, and ethical manner. It is improper to shift this responsibility to other members in the social group or to other social structures and institutions. Fri, Jan 13, 2012 : 3:07 p.m.
Fri, Jan 13, 2012 : 3:32 p.m. I think marriage should only be for people who feel it is an important expression of their religion. Since it has been defined as specifically a union between a man and a woman, I think it has no place as a main stream institution in our society outside of a religious context. It clearly violates any understanding of equal rights for all that I am aware of. I think we need a non-discriminatory method of signifying a union between committed partners that is recognized by law. I do believe in god, but I cannot find any valid expression of my beliefs in any organized religion. And I believe in committed relationships, but I do not feel the need to attach that to my religion. I do value the idea of having a legal and societal recognition of my relationship with a significant other. I feel like we really need a replacement for &quot;traditional marriage&quot;.